This is an Indian style Red Pepper Chutney that my mother-in-law serves with rice, but it goes wonderfully with idli, dosa and roti. It is also great as a dip and as a sandwich spread. Red bell peppers contain twice the Vitamin C as regular green bell peppers, and are considered potentially cancer-fighting due to the antioxidants in this vibrant colored fruit. 1) Heat oil in a wok / kadai on medium flame. Add mustard seeds and wait for it to pop. 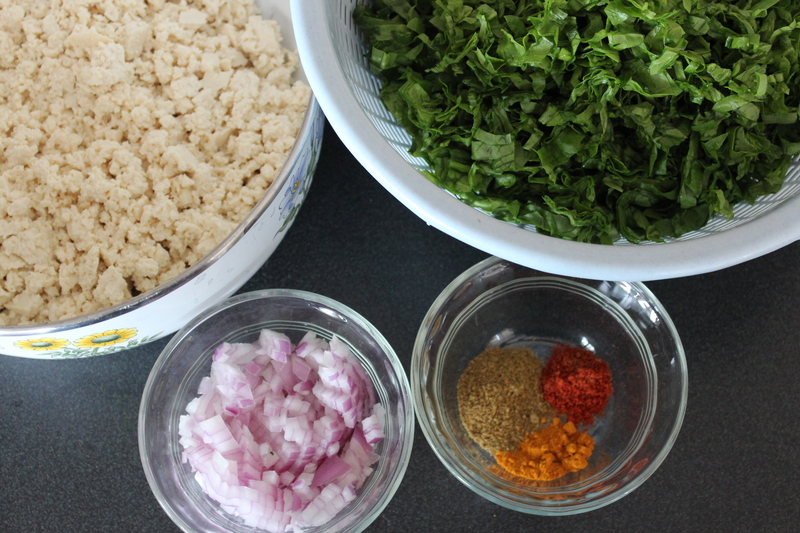 2) Add hing, udad dal, red chillies, fenugreek seeds, and curry leaves one after the other, waiting a few seconds in between each ingredient. 3) After all ingredients are roasted and the udad dal is golden, add the chopped peppers and salt, and stir fry for 7-10 minutes on medium- high, uncovered, stirring often. (While the peppers must not be raw, it does not have to be overcooked.) Roast well. 4) Turn off stove and allow to cool. 5) Blend ( as fine or coarse as you like – I make my fine) with tamarind paste and adjust salt to taste. NOTE: The peppers tend to release a lot of moisture while cooking and the udad dal helps bind the chutney together when blended. This is not a paste-like / jelly-like chutney, but more like a dip. If you prefer, you can increase the udad dal quantity. Posted in Chutney, Sandwich & Wrap, Vegan. Delicious and easy. 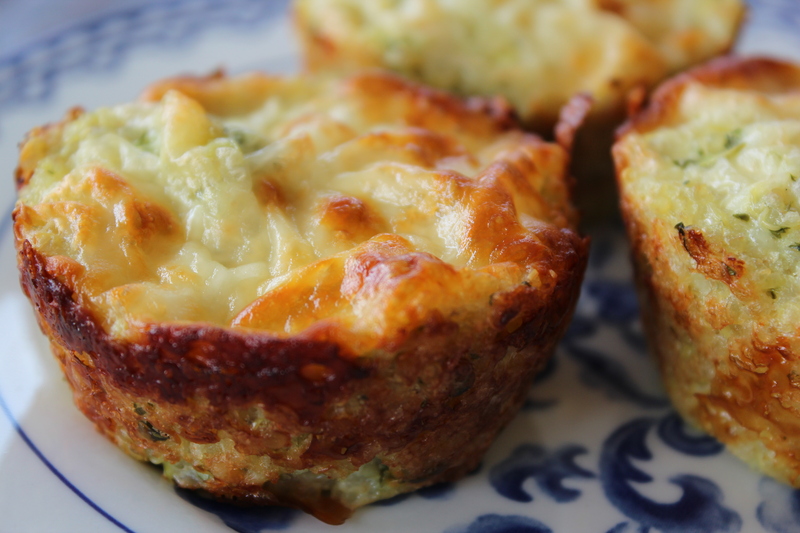 I make these all the time and freeze for a quick breakfast or snack. The key is to not over-mix the dough. 2) Sift or run a fork through the dry ingredients (flour, baking powder & soda, salt, cinnamon, mace, nutmeg) to combine well. 3) Combine oil, sugar and eggs on medium with a hand held blender or with a whisk. 4) Gently stir in the carrots and mix well. 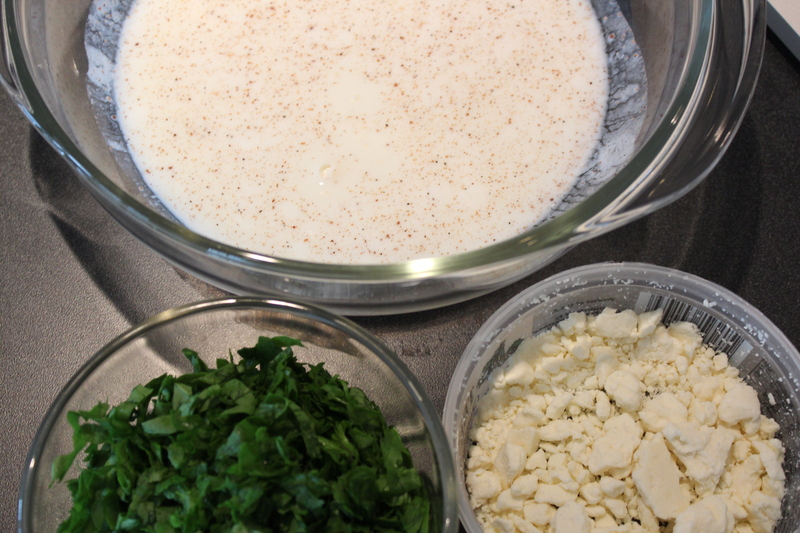 5) Add the dry flour mixture to the wet mixture and gently stir until just mixed. Over-mixing will result in denser and tougher muffins. 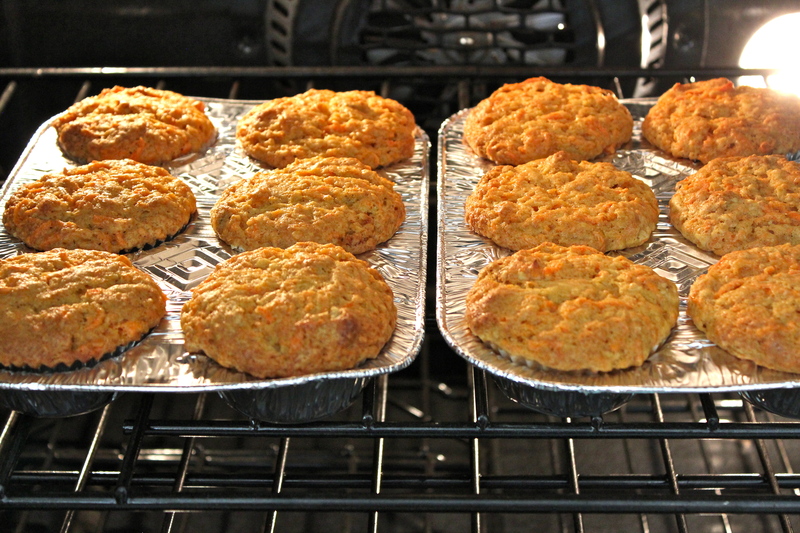 6) Fill lined muffin-trays and bake for 25-30 minutes. NOTE: I sometimes add in 1/2 cup raisins and 1/2 cup chopped walnuts. Stir these in with the carrots before adding the dry ingredients. You will end up with 2-3 more muffins for a total of 14-15. Also note that if you do not have nutmeg and/or mace, you can increase the other spices. I have on occasion used pumpkin pie spice because it was handy. To make this recipe lower in fat and calories, you may substitute 1/2 cup oil with 1/2 cup mashed banana or applesauce. Eating at least 5 servings of fruits and vegetable a day is considered part of a healthy diet. We all know that besides providing vitamins, minerals, and fiber, most vegetable and fruits are low calorie, and more importantly, disease preventing. But I felt overwhelmed with all the confusing and contradictory information available, and wanted something simple and practical to follow at home everyday. Here’s what I found, and I hope the information below helps. The Centers for Disease Control & Prevention (CDC) – a US federal agency under the Department of Health and Human Services – website offers some excellent and clear guidelines for healthy diet and lifestyle. Use the Fruit & Vegetable Calculator to figure out how many servings your body needs per day based on gender, age, and level of physical activity. 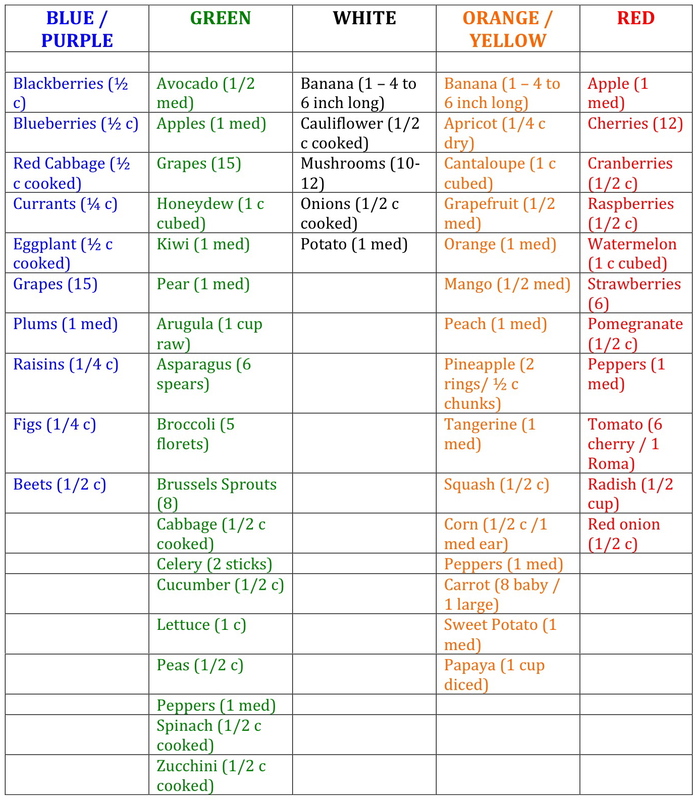 Handy picture chart of what makes 1 cup of fruit / vegetable. I also printed several copies of this chart and taped it to my kitchen board. It’s an easy and good visual reminder to eat better (and of how much my diet is lacking!!). My 8-year old helps track and color what we eat each day, and I think it’s good to make kids aware of healthy eating habits. 1) Heat oven to 325* F. Spray two muffin trays with cooking spray. 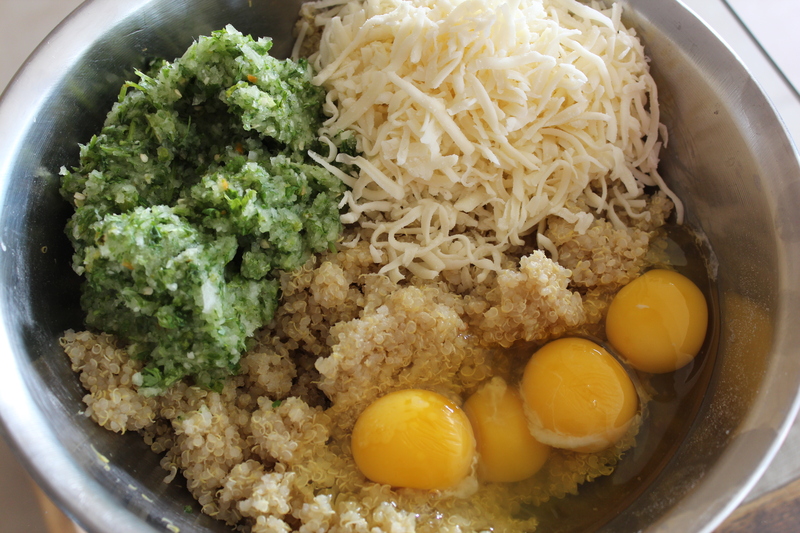 2) Gently mix all ingredients till combined. 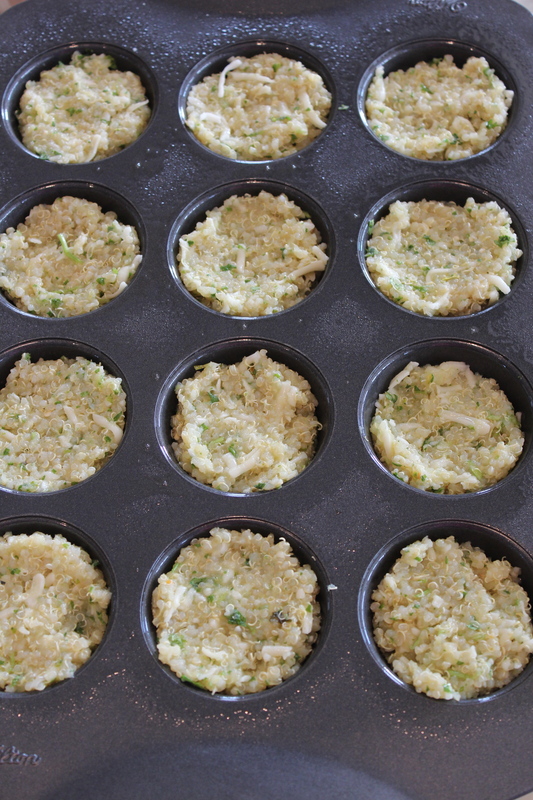 3) Fill muffin cups 3/4 of the way and gently press down. Bake 25-30 mins till set, gently lifting one muffin to check if crust is light golden brown. NOTE: I put the onion, chillies and cilantro in a small food processor to make it easy. Make sure not to make it too fine as the onions will release more moisture. For easy clean-up, you could line the muffin tin with cupcake liners, but I find that they do not give crisp golden edges. MAKE AHEAD: Once cooled, these muffins can be stacked in a freezer bag and frozen for a few weeks. To reheat, cover with a paper towel and place 2 in the microwave for about a minute and let it sit for another minute (time varies according to microwave power). 1) Drain the tofu and place in a colander on top of a large bowl to catch extra liquids. Place a heavy weight (or a pot filled with water) on top of the tofu so it presses down and squeezes out as much liquid as possible. Alternately, place tofu in a colander on a bowl in the refrigerator overnight to drain. 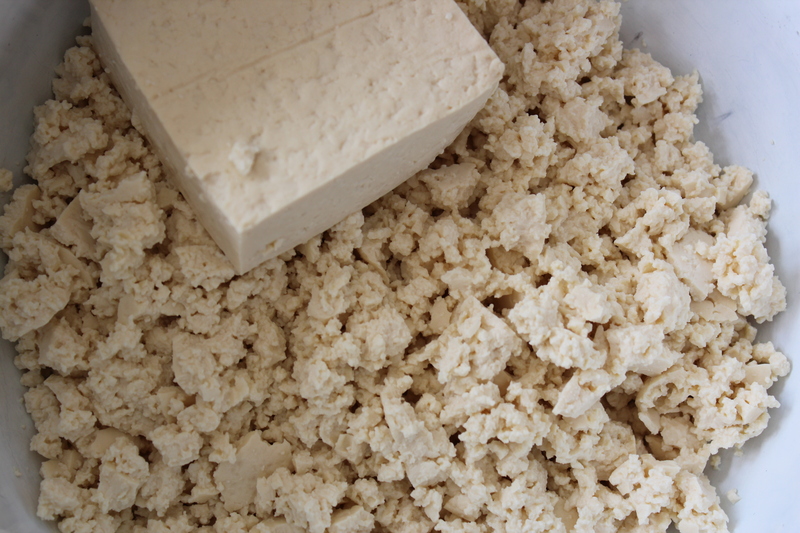 2) Crumble tofu. Finely chop the onions and spinach. 3) Heat 1tsp oil in a pan and saute onions till opaque and soft (or brown them if you like). 4) Add tofu and stir fry till lightly roasted on a medium flame, stirring frequently. 5) Add spices and roast for a minute. Then add spinach and salt, and saute till just wilted. Turn off heat and stir in lemon / lime juice to taste. NOTE: I have substituted fresh spinach for frozen chopped spinach / kale. The spices and their quantities can be switched to your liking. I make another version with tofu, onions, jalapenos, cilantro, black beans, corn and diced tomato. Again, any of these items can be switched to suit your taste. Roll in a whole-wheat tortilla or stuff in a pita for a sandwich alternative. MAKE AHEAD: This dish (and its variations) keep well in the fridge for a few days and can be reheated in the microwave. Posted in Breakfast, Eggless, Vegan. Seriously delicious!!!! Left overs were good, and it can be assembled or cooked the night before. I have slightly changed this recipe from the original – you can watch the video at Inspired Taste. 1) Preheat oven to 375°F and spray a 10-1/2 by 7 inch baking dish with cooking spray. 2) Mix oats, sugar, baking powder, orange zest, cinnamon, salt, half the walnuts, half the strawberries and half the chocolate in a large bowl. 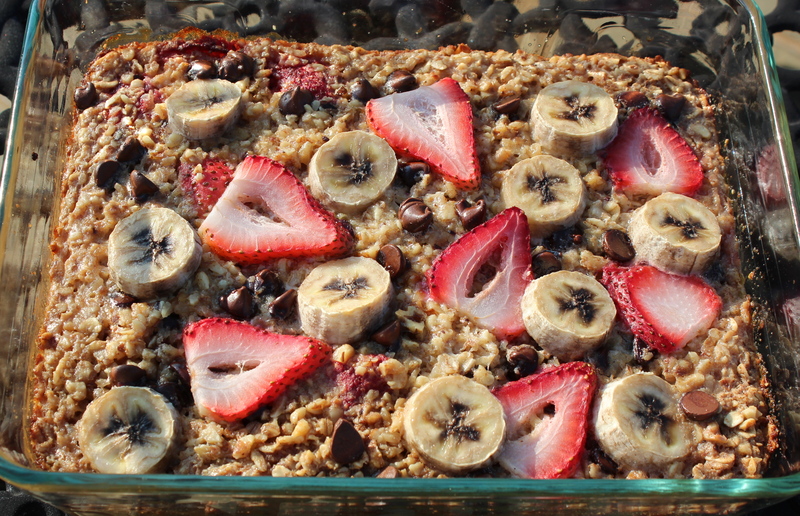 (The other half of the strawberries, walnuts and chocolate go on top of the oatmeal). 3) In another large bowl, whisk together the milk, egg, butter and vanilla extract. 4) Add the oat mixture to prepared baking dish. Arrange the remaining strawberries, walnuts, chocolate and sliced banana on the top. 5) Pour the milk mixture evenly and shake the baking dish to distribute it through the oats. 6) Bake 35-40 minutes till mixture is set and the top is golden brown. 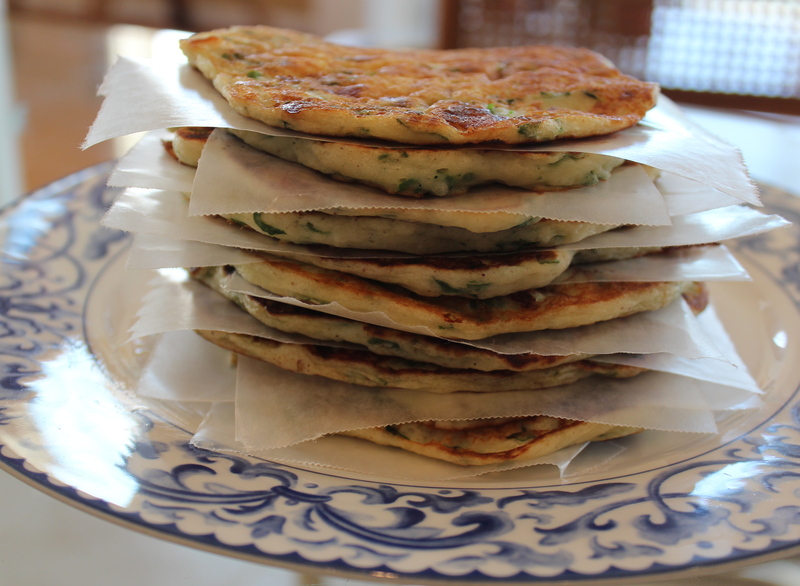 NOTE: The original recipes notes that this dish can successfully be prepared without egg. Substitute the milk, nuts, fruit, and chocolate with any variety you prefer. While topping the oatmeal with the sliced berries and banana makes for a pretty presentation, you could also mix all ingredients together to speed up preparation. MAKE AHEAD: The cooked oatmeal kept well for 2 days and was easily reheated in the microwave. After years of leaving for work with just coffee, I finally got my husband to start eating breakfast. 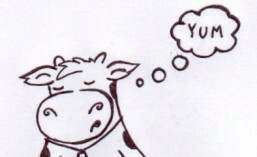 He isn’t a fan of muffins, bagels, pancakes, etc., and would love a hot, spicy Indian dish each morning. NOT HAPPENING!!! 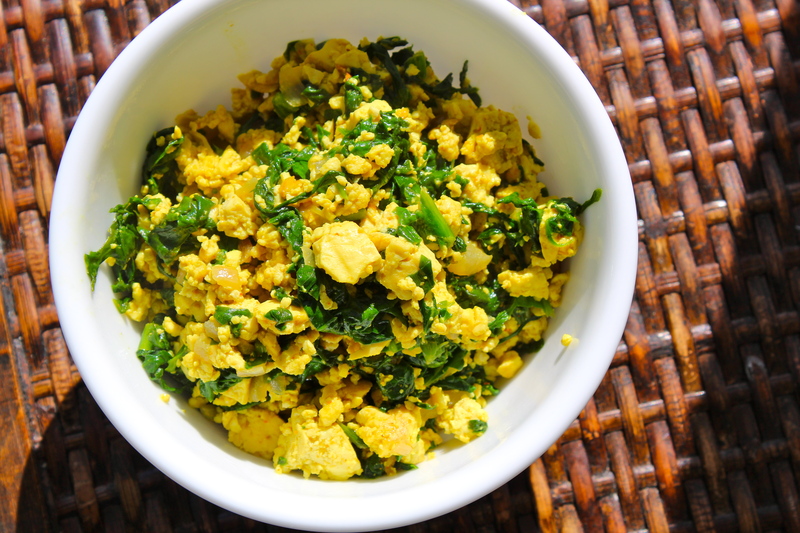 Surfing for savory and easy breakfast recipes that I could make ahead took me to Vegetarian Nirvana. 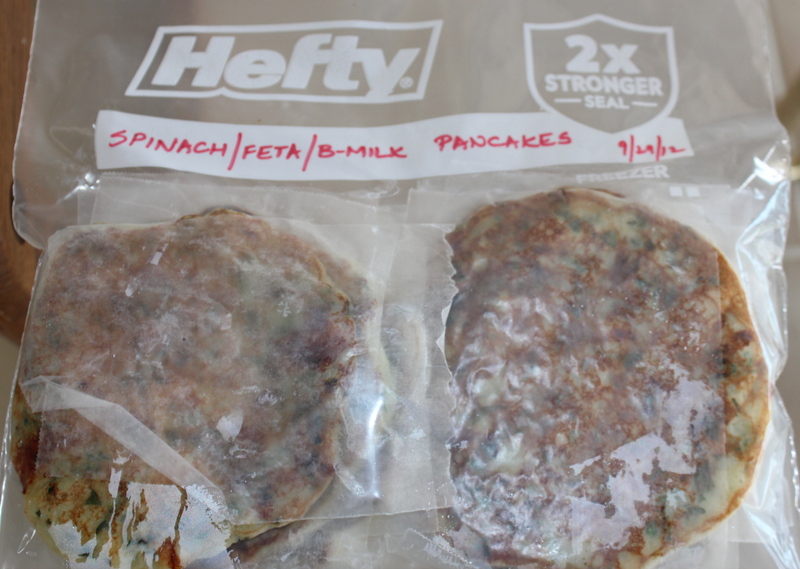 These pancakes are eggless, savory, and can be frozen. I have made a few changes to the original recipe and it is a big hit in our family. 1) Measure out baking soda, salt, pepper, nutmeg, and chilli powder. 2) Gently mix with buttermilk so it can start its leavening reaction and set aside 2 minutes. 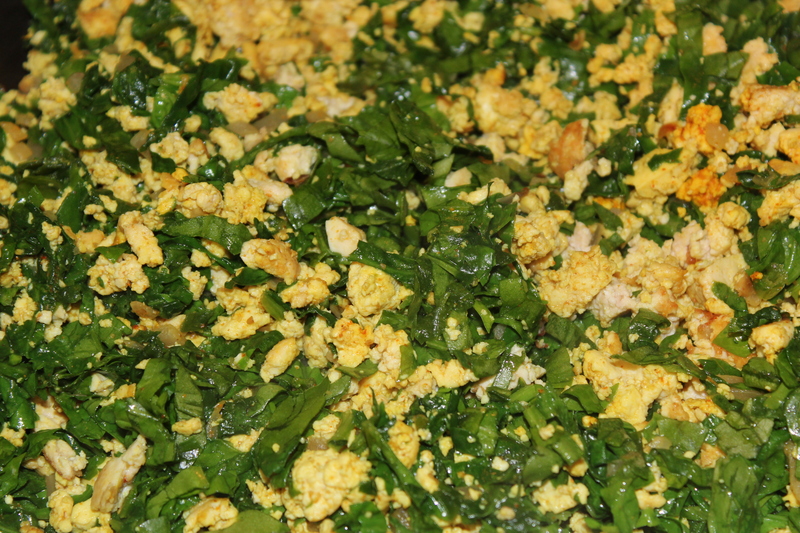 3) Stir in spinach & feta till just incorporated. 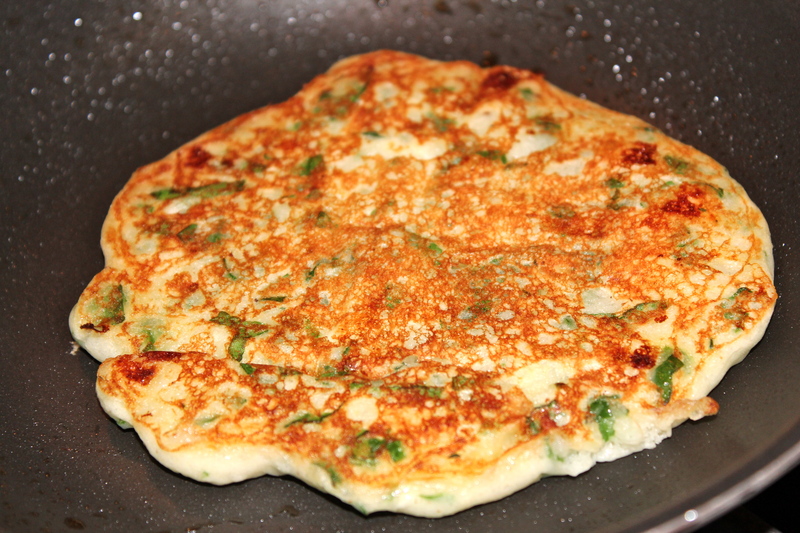 4) Gently stir in pancake mix till mixed and no lumps are visible. Do not overmix. 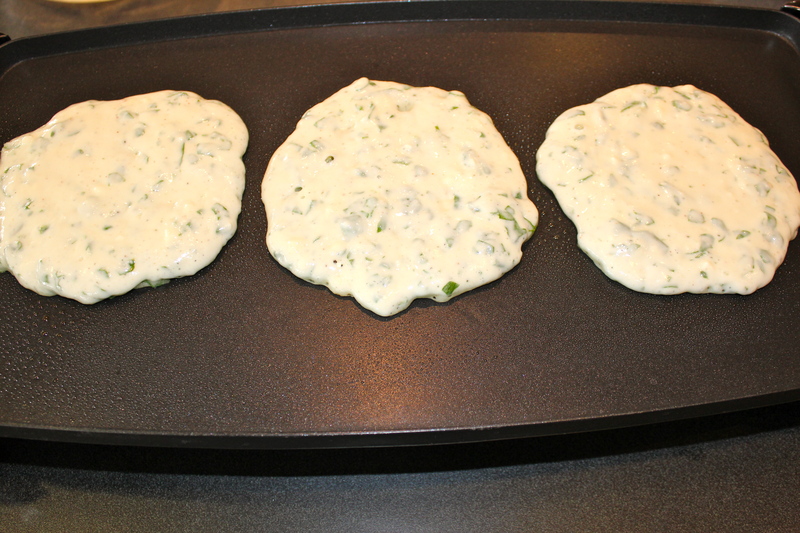 5) Cook 1/4 cup batter on a hot griddle till golden brown like regular pancakes. NOTE: Cheese is optional. Add any seasoning to adapt to your tastes. My 8-year old love his with ketchup while my teen has his pancakes with spicy Sriracha. MAKE AHEAD: Cool completely and stack with pieces of wax paper inbetween. Place in a freezer bag and seal after removing all the air. Can be reheated in the microwave for 30-45 seconds.